Parkscope: Transportation, Transformed: How and Why Test Track II is EPCOT Center, Revitalized. 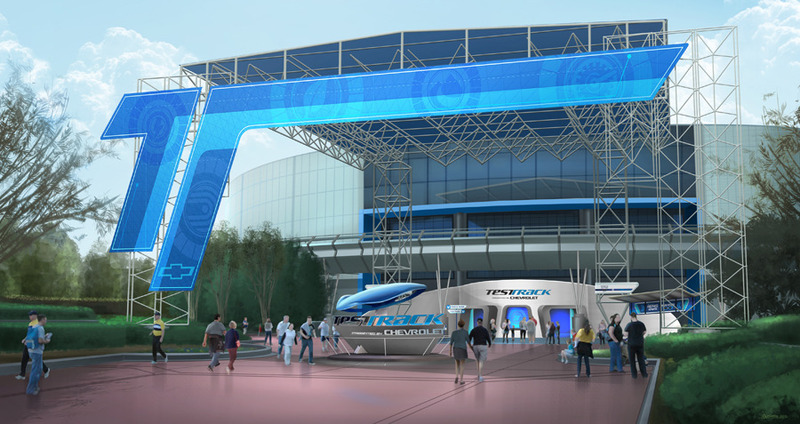 Transportation, Transformed: How and Why Test Track II is EPCOT Center, Revitalized. For over a decade, now, EPCOT Center has been gone from Walt Disney World. “Epcot” has taken its place, as EPCOT Center, and the original concepts and ideas for the park have been watered down, nullified, and altered, foolishly, in my opinion, to fit the supposed needs of Disney’s guests. These “needs” that Disney conformed Epcot to are not fundamentally ones that are in line with the park’s original aims. Those aims were centered around exhibiting optimism, futurism, and culture in a World’s Fair setting. Transforming EPCOT into Epcot took these constructs away from exhibition and squarely changed them into experiences. While that’s not a bad idea, the thematic trappings that accompanied them were. World of Motion, EPCOT’s transportation pavilion showcased the history of man’s achievements on the move. The first version of Test Track ignored that progression and centered on the experience of testing a modern day car, something decidedly not optimistic or futuristic. And thus, the unified and driving force behind EPCOT Center was fragmented. Epcot would go on to do this across the board, to many of their pavilions. While still being primarily about “discovery” and science, Epcot’s changed theme wasn’t always futuristic or conducive to the park’s original aims or theme of exposition. And now, in recent years, Epcot seems to be realigning herself to those old thematic constructs in subtle ways. Test Track 2 has recently debuted in Future World, replacing the old ride’s aesthetic and intent of simple crash testing in an automotive proving ground with the sleek and other worldly experience of being in a computer simulation. The experience is heightened by the preshow and the further involvement of actually designing a prototype vehicle. And, here’s the rub: With personalized involvement, and the ability to see why and how design choices are vital to the construction and creation of a form of transportation, a little bit of EPCOT Center has come back to Epcot. Test Track 2 thrives on interaction, and interaction that showcases a vision of the future spurned on by choices and creativity. While not fully aligned with EPCOT Center’s strides to be optimistic and grand, the same personal spirit can be found in how Test Track 2 now approaches futurism and the guest’s (and by extension, humanity’s) role in it. The rest of the gap between Test Track 2 and EPCOT Center is bridged in the aesthetics and feel of the entire pavilion. Where the old preshow was a cavernous jumble of automotive clutter and ugly equipment, the new queue and preshow takes place in a subdued showroom, with soft lighting, brilliant screens, and models of futuristic cars and vehicles. Here, is where EPCOT Center’s influence is felt the most. Open and spacious, sleek and bright, the preshow lends itself to being functional but clean and with a purpose. 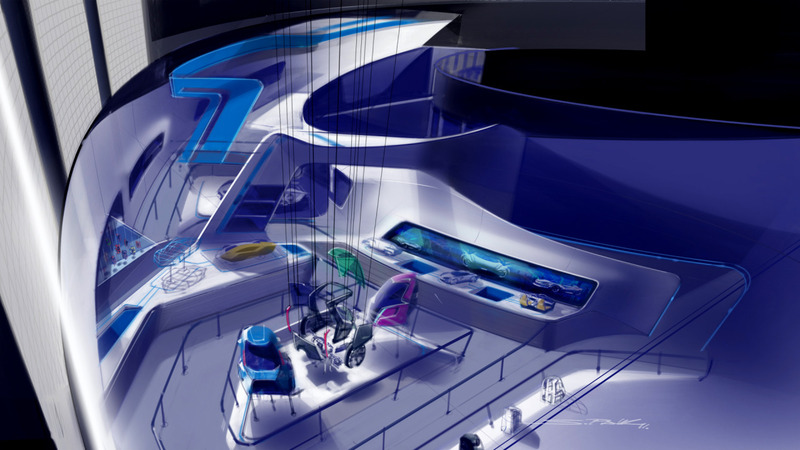 It also brings back some exhibition to Future World as various concept cars are displayed along with informative videos highlighting the importance of design choices and different factors that effect a design’s responsiveness and capability. 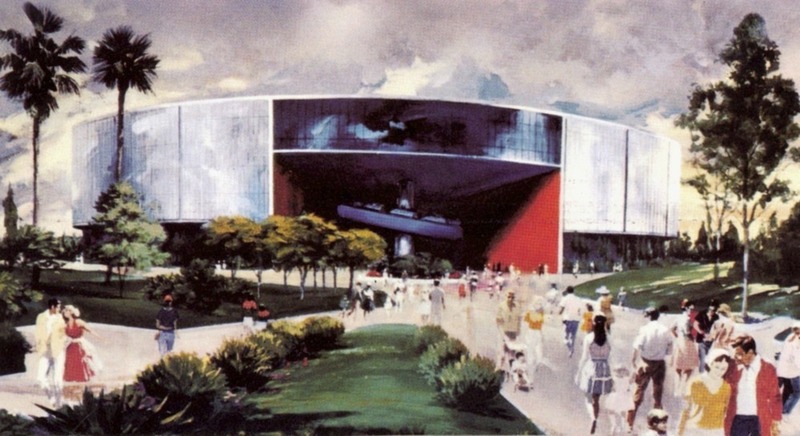 The final execution of the queue’s aesthetic is oddly familiar to the 1979 plans for World of Motion’s queue. 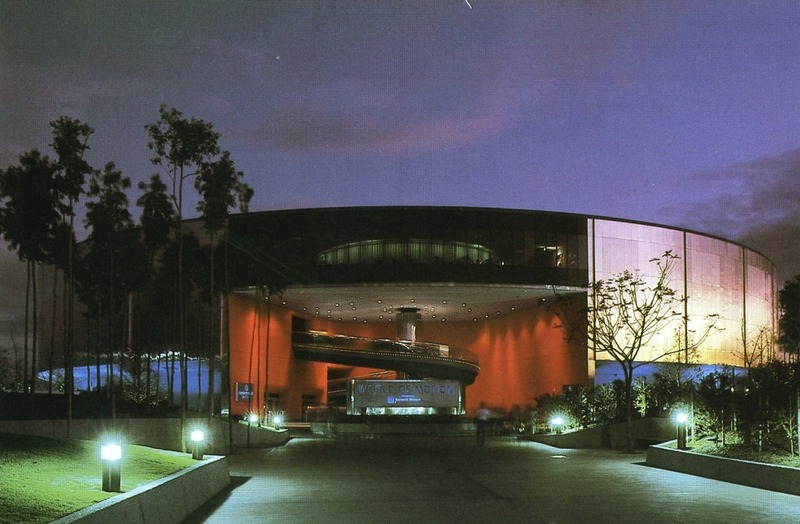 Designed by Tim Delany, the original concept for the queue would have housed models of various forms of transportation, supporting the pavilion’s theme. Now, Test Track emulates this concept with it’s own “exhibition queue”, a improvement over the “walking through a warehouse” aesthetic that Test Track 1 attempted to thrive on. The only remnant’s of Test Track 1’s old feeling is left outside, and above the entrance: the overhang and tarps over the entrance. In all honestly, this is the only blight on the refurbishment’s aesthetics, as the hodgepodge of trusses and tarps are the exact opposite of the pavilion’s sweeping lines and monolithic shape. Those motifs are carried out through the preshow and queue, as is a subdued color pallet of silvers and blues. The ride’s aesthetics follow the same pattern of color and texture, but are much more augmented to place riders into the world of a computer simulation. Unlike other “modern” Epcot attractions, there is no disclaimer warning guests that this is all an illusion, that you don’t leave the building, and that your imagination should do the rest of the work that lazy thematics should. (Yes, I’m talking about Mission: SPACE…) Instead, the computer dynamics and aesthetics of the ride are made to look as fantastic and otherworldly as possible, allowing a rider to think for themselves as to what they are experiencing. For me, this subtle lack of “narrative” on the design choice is a wonderful continuation of how WED designed rides to be about experience and personal interpretation. In the Haunted Mansion or Pirates of the Caribbean, there is no real right answer to the “story” of what you experience. To me, they’ve always been “trip into a haunted house” or “Pirates doing pirate things”. 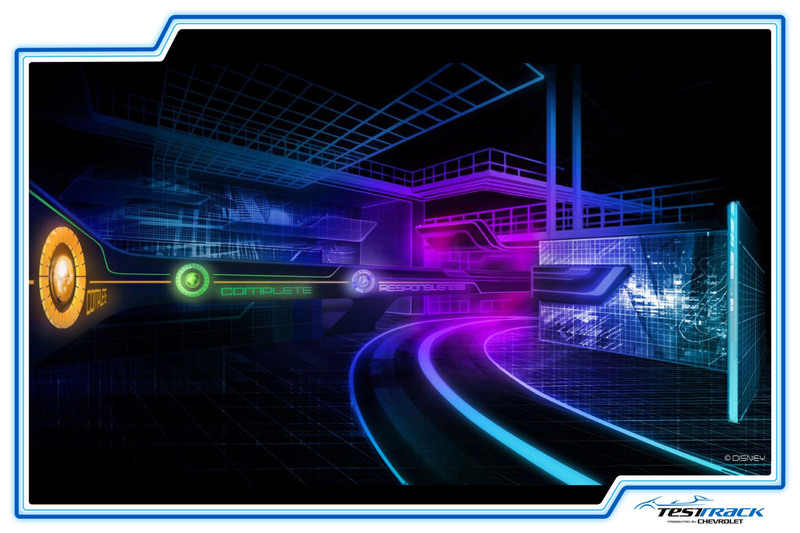 Test Track 2 now offers the same way forward in its thematic execution. After you choose your design choices, the actual experience of the ride is one that is of your own imagination. The experience isn’t something concrete and forces you to overlay your own thoughts onto what you see and feel during the course of the ride. * Personally, I took the experience to be one of fantasy, as you board your car in the design studio, and are subjected to tests. Meaning, Test Track doesn’t physically take you through a computer or a program, but rather subjects your conscious design choices to a simulation. Given the fact that the narration welcomes you to the “SimTrack”, this isn’t a stretch. Meanwhile, fantastic science fiction aesthetics are nothing new to EPCOT. World of Motion’s finale, the CenterCore (a massive representation of a city on the move) was evocative, other worldly, and almost alien. 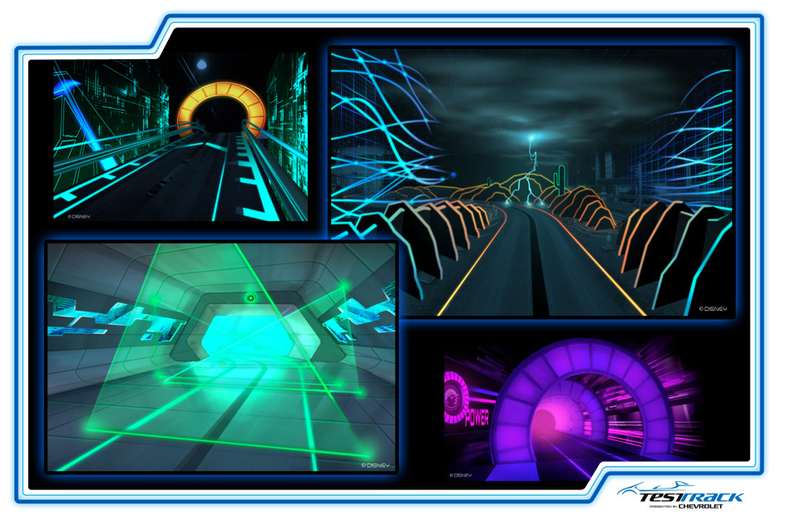 Test Track 2 feels the same way… and pays a wonderful homage to CenterCore with it’s own futuristic urban setting. EPCOT Center was grounded in a realistic sort of fantasy, as Horizons took you to the dawn of a relatable future, and The Living Seas offered a comfortable, but futuristic environment. Test Track 2 builds on the same premise during the ride experience, that this vision of a computer test is believable, based on the aesthetics and mechanics of the technology we interact with on a daily basis. The visceral ride experience is still fast paced, and still loud, and still frenetic. To expect anything else from this refurb would have been folly. While these attributes of the ride aren’t exactly the quiet and thoughtful atmosphere for the realizations and opinions I’ve proffered here, (this post took several ride through to let everything sink in, though, I did enjoy TT2 from my first encounter with it!) the meaning of the ride is apparent to those that get to design and build their own vision of a vehicle. Thus, meaning is what makes Test Track 2 the intellectual successor to the World of Motion, and the closest the park has gotten to an EPCOT Center level of attraction in quite some time. From the optimistic and pressing score that accompanies guests in the queue, to encouraging creativity in the design process, to the sheer delight of being immersed in a ethereal landscape, Test Track 2 feels like it has a defined purpose. Where the original iteration of this ride was just about the cheap thrill and experience of testing a modern day car, this version has nuance. Your decisions matter, your car gets tested, your ideas can help shape tomorrow’s mobility. When placing that set of ideas next to the warm and optimistic experience of EPCOT Center, Test Track 2 fits snugly next to the humanistic experience that got lost along the way. Now, fortunately, a part of it, has been rekindled, in this new version of the attraction. All of this said, Epcot has a long way to go in becoming close to what EPCOT Center was. That will take changes like these applied on a grand scale, that unify Future World with similar aesthetics, meanings, and messages. Test Track 2 is certainly a stride forward, in matters of meaningful entertainment, and the proper feel for what makes Epcot continuously captivating and enlightening. Test Track 2 is an excellent start in pivoting Future World and Epcot back towards living up to the grand standard set in 1982, 30 years ago, and just at Disney’s dawn of the 21st century. *@Jonathan_Prime (twitter) helped work out this line of thought in a much more cogent manner than I was originally describing. Cheers!